At locoyard hq we are experiencing some IT issues, namely the PC has completely failed and with it access to photographs… Shock horror! So whilst a replacement computer is on order, I’ll have to be imaginative about content over the next couple of weeks, especially as it will involve writing blog posts on a smartphone. What better way to ponder, than over a ale! 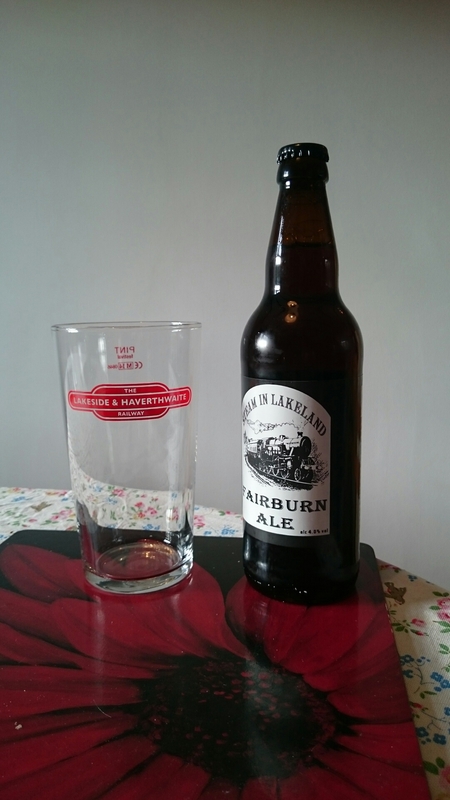 Fairburn ale is produced by the Ulverston Brewing Company for the Lakeside and Haverwaithe railway. Appropriately, the ale has a smokey hint to its malty flavour. It is a tasty ale and two bottles can be purchased with a pint glass, making for a perfect souvenir. It comes highly recommended. Rail and ale go well together, both being traditional and very enjoyable. The Lakeside and Haverwaithe Railway have to be congratulated in producing a unique and genuinely tasty ale.